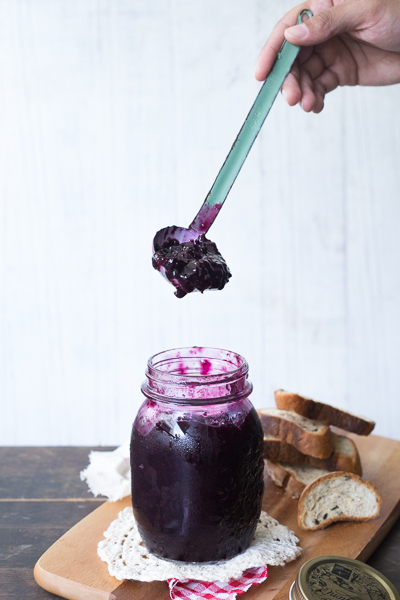 Making jam at home is easier than it is made out to be. I’d come across recipes in the past that went into detailed instructions about canning equipment and sterilizing jars..it completely threw me off. You don’t need any heavy-duty ‘canning equipment’ here, and I realized that sterilizing jars is just a clinical term for washing the jars with hot water and drying them before use. The process of making jam is easy, but it helps to know a little about the fruit that you’re using. Keyword: pectin. What is it and how does it affect my jam? Pectin is a naturally occurring fibre that is found in all fruits and vegetables, and when cooked to a high temperature along with sugar and acid (in this case, lemon), forms a jelly like consistency. 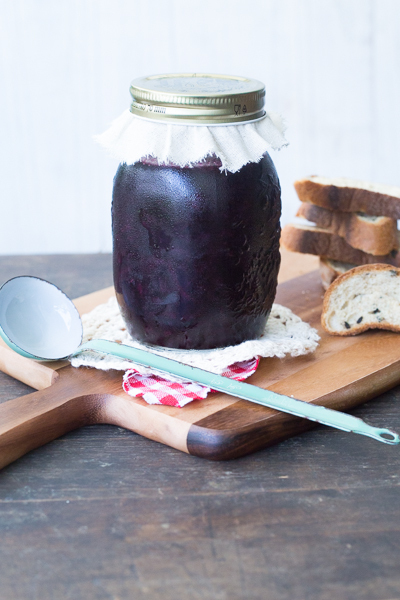 Pectin is what is responsible for giving jams their ‘set’. While fruits like plums, apples, oranges (and most citrus) contain high levels of pectin, berries: strawberries, raspberries, blackberries etc. have very low levels of it. 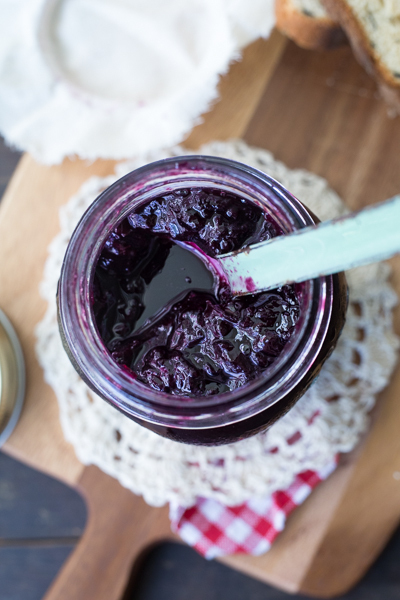 Although you could add pectin (sold in shops mixed with sugar or just in packets) to add the required bulk to your jams and preserves, pairing up low-level pectin fruits with those containing high levels is a good way of getting around this problem. For example, using apples and blackberries together. 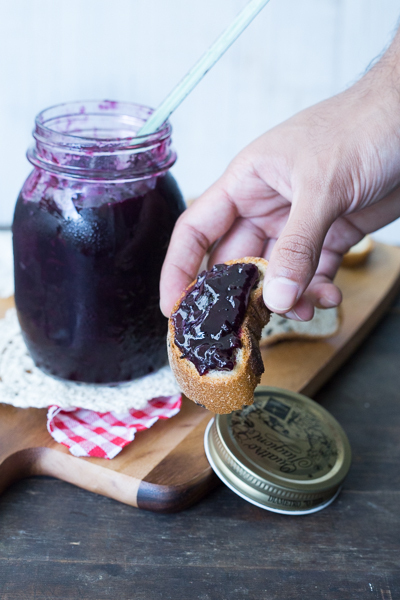 Having spouted off all this information about pectin and its role in jam making, you can still make a really good low-pectin fruit jam using just fresh fruit, sugar and lemon juice. A slightly longer cooking time, and maybe some extra sugar is all you need. David Lebovitz has a really good recipe for a strawberry jam without added pectin. I loosely followed his recipe for both my melon jam with star anise and plum jam. I used seedless grapes in this recipe because I roughly puréed the grapes before cooking them (slightly unorthodox, but gives quicker results, and that’s always what I’m after). I preferred to keep it chunky and left the skins on, but strain the pulp once cooked if you like it smooth, like a grape jelly. Wash the grapes and add them to a blender. Blend for a very short time, about 5 seconds, until you get a coarse purée. Add the blended grapes, sugar and lemon juice to a heavy-bottomed pot. Cook on a medium high heat, uncovered, until the juices start to thicken. This should take about 15-20 minutes. Stir occasionally, skimming off any foam that rises to the surface. Strain the jam if you like it smooth. Ladle into jars and refrigerate once cooled. Stays good refrigerated for up to 6 weeks. Don’t know how I missed seeing your comment. The sweetness of the grapes really does make a difference, but the ones I used here were pretty sweet too. Either way I’d say add half, and you can always add more after you dissolve the first bit and taste. 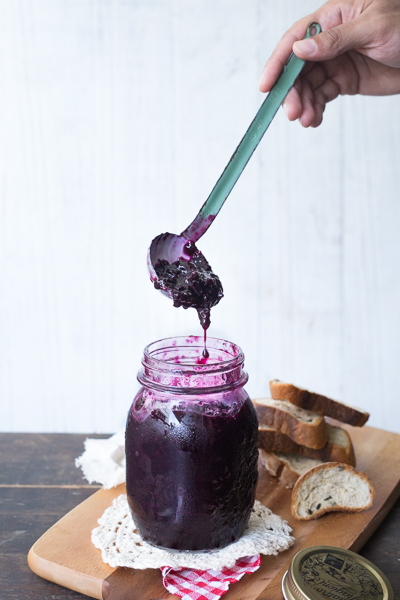 Two options for grapes with seeds: 1) use as is without blending and run the jam through a sieve at the end; will essentially be smooth and without bits. 2) removing the seeds. Seems like a slightly cumbersome process, but for chunky jam, this is the way to go. Green apple + grape sounds great! I’d love to know how that turns out if you try it!